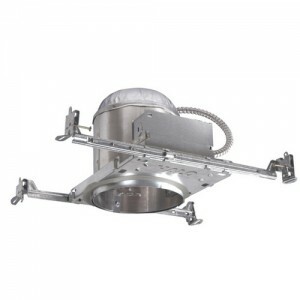 The Halo H750ICAT 6" Dedicated LED IC AIRTITE Recessed Housing is quickly rising in popularity as one of the best in the business when it comes to new home installation fixtures. Perfect for general lighting tasks anywhere in your home, this unit proves itself over and over again as a standard in modern housing fixtures. With a focus on solid state lighting, the Halo H750ICAT also meets Energy Star standards, meaning your wallet doesn’t suffer for achieving optimal lighting. Housed in an aluminum shell for greater heat dissipation, this device can prevent heat from flowing between temperature regulated living spaces and non-regulated airflows outside. Its galvanized steel frame also secures the unit to the ceiling steadily, giving you peace of mind against malfunctions. This Halo LED module easily installs by means of a plug-in line voltage wiring connector, making it optimal for do it yourselfers. It also comes backed with a three year manufacturer’s warranty. For use with 6" LED Recessed Trims in:  Bronze Satin Aluminum WhiteFor Use in Insulated Ceilings and Direct Contact with Insulation. Housing: Aluminum construction for greater heat dissipation. H750 ICAT housing is gasketed to prevent airflow from heated or air conditioned spaces. Plaster Frame: Galvanized steel frame. Housing adjusts in plaster frame to accommodate up to 1" ceiling thickness. Regressed locking screw for securing hanger bars. Cutouts included for easily crimping hanger bars in position.